You will recall, I’m sure, that last year the Imperial War Museum in London undertook a digital restoration of the 1916 documentary The Battle of the Somme, the DVD release of which we reviewed here in detail. The Battle of the Somme was the first of three high profile feature-length documentaries that the British War Office propagandists produced during the First World War, before they changed strategy and turned much of their filmmaking energies towards producing a newsreel. The two films were The Battle of the Ancre and the Advance of the Tanks (1917) and The German Defeat and the Battle of Arras (1917), and while neither could match the seismic social impact of the first film, they remain eloquent testimonies of the conflict. There is a chance to see The Battle of the Ancre this weekend at the Imperial War Museum, as they start to give it much the same treatment as they did to the Somme film. The DVD release of The Battle of the Somme was distinguished by its twin scores, one of which recreated the original score from contemporary musical suggestions for the film’s exhibition. The same musician, Stephen Horne, is doing the same with The Battle of the Ancre. The ‘new’ score is the result of months of research by Horne and Dr Toby Haggith of the IWM, the reconstituted score is to be played by Stephen this Saturday (7 October) for the first time since the war, which makes the screening a truly special one. The film carries on the story from the first film, as it were, covering the Somme campaign as it dragged on into the winter of 1916. Its major selling point was the tank, the first time audiences had had sight of this startling new weapon. 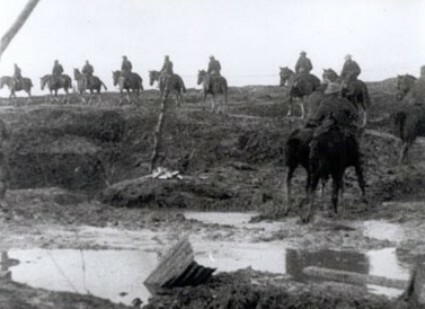 The film also memorably documents the ordeal faced by troops in the sea of mud that was the Western Front that autumn and winter. The screening takes place 14:00 at the IWM London Cinema – all the details are on the IWM site. While were on the subject, you might like to take a peek at IWM Film and Video Sales, an online footage sales service from the IWM, still in test mode. The site offers you the chance to view for free some 150 hours of content (a lot of it from the First World War), to download such content for private viewing or commercial scene selection (a charged service), or to look up the details of over 35,000 films. The Bioscope will be producing a review of this major new service very soon.